Robert Blackie Aikman attended the University for a year in 1908 to study Mercantile Law. He was born in Belize, then British Honduras, on 11 June 1882, son of William George Aikman, a general merchant and commission agent. Aikman was educated at Glenalmond College, Perthshire, and graduated BA from Clare College, Cambridge in 1905. 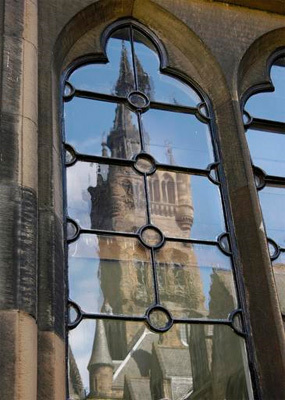 While attending the University of Glasgow, Aikman gave both his home and term address as 12 Kingsborough Gardens, Kelvinside, Glasgow. Aikman worked as a merchant and insurance broker. With the outbreak of the First World War, he served as a Private, of the Queen's Own Royal Glasgow (QORG) Yeomanry in 1915, and was ranked 2nd Lieutenant of the Lanarkshire Yeomanry (Territorial Forces) on 16 February 1915. He retired due to ill-health, from neuritis caused by exposure during training in Scotland, in 1916. He went to South Africa to farm, where he died near Clocolan, Orange Free State, on 11 November 1918.